Our state is polled for the 17th parliamentary election – that’s happening at many phases across the country – and today I exercised my franchise by casting my vote to torch symbol that represents the Makkal Neethi Maiyam (People Justice Center) headed by actor Kamal Haasan but I wasn’t intend to poll for the party and I doubt will I voted MNM if the candidate wasn’t R. Rangarajan IAS. I read his profile, ideology presented as manifesto and the clear state of mind on political scenario and expressing the intentions to implement on the constitution and overall a coolly personality to enrich his duty. The voluntarily retired, as sub-collector and officer on duty, joined MNM party to serve people directly after inspired by Kamal’s political ideology and he’s an important pillar in designing the party manifesto. I never voted just considering a party alone. For me, first it was the candidate and I believe only if we select the right person better things could happen because he’s going to be the connector between the govt. and people and if it’s going to be a problem how we could receive good signals. Candidates are the basement of a strong parliament or legislative and anyone defective could bring deceive to people. Though I don’t say who I voted were the best but I tried to choose who’s better through my perception rather opt for party politics. I believe in the saying ‘politics isn’t corrupt but the politicians’, so here I want to choose a right representative to talk to their leadership in achieving the goals for the constituency. I initially thought of voting the opposite party candidate but changed my decision, though she had a good profile she sounded like a party depended. 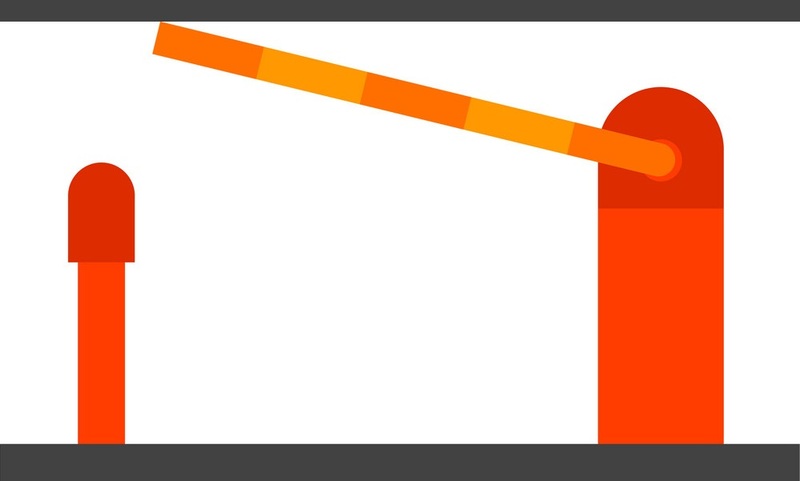 At the end of the poll Tamil Nadu (our state) recorded 70% of voting and to my disappointment my constituency (Chennai South) becomes the 2nd least record percentage with 58% following 57 % in Centre Chennai. I see this as a democratic assassination because Chennai South is where the most educated live and economically leading. The Chennai IT corridor comes under this constituency and well established education institutions, and posh and upper middle families lives lot there alongside dense labour communities but still this less percentage gives a shame on people. When other constituencies recorded above 70% with most rural aspect, these city dwellers (who benefits lot) failed to be socially responsible and democratically right. 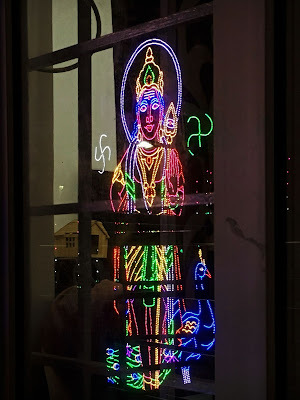 My window reflection on the light decoration of lord Murugar from last month’s temple festival at the backstreet. And for more colors go here for the entire post on the colorful festival. 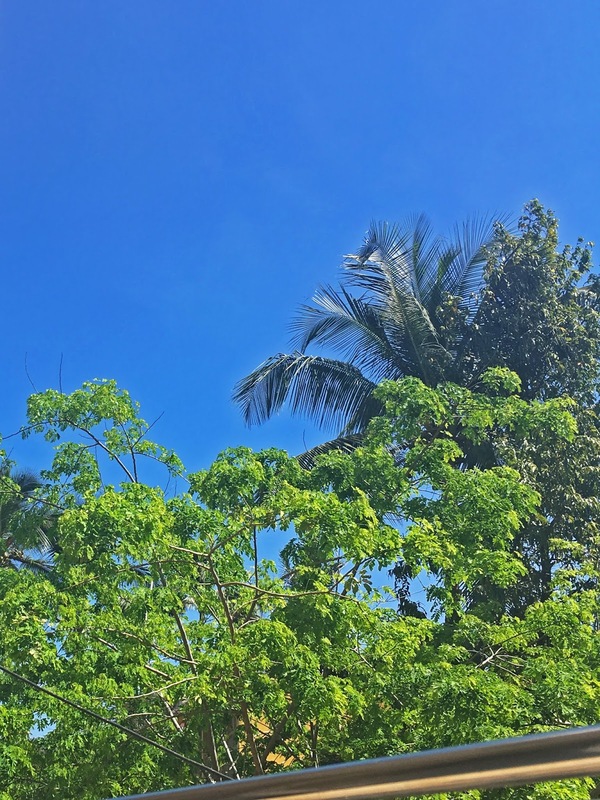 Other day in late February my afternoon sky turned pretty much in blue and got clash with the shimmering green tree that saw new shoot as sunlight exposed through it. 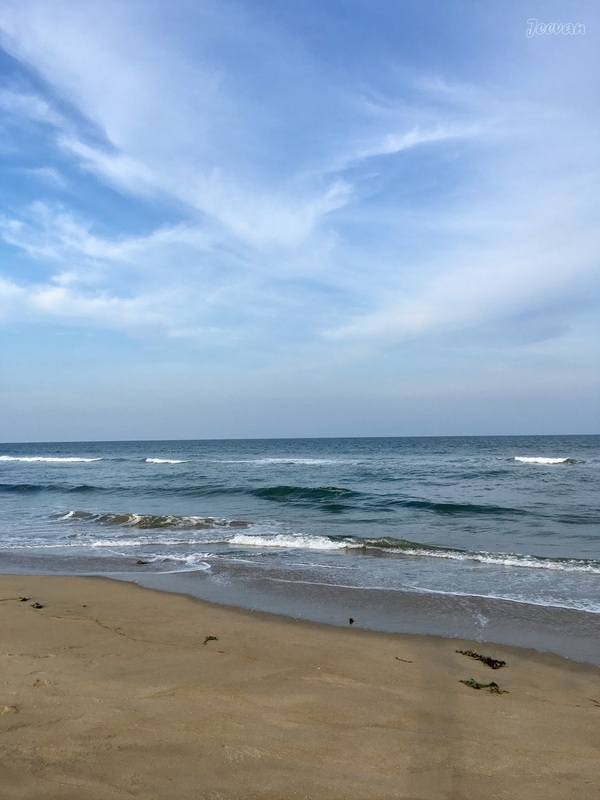 Though summer is here, Chennai continue to stay little out of the heat while other districts experience sultry, the sea breeze blows like a life saver. 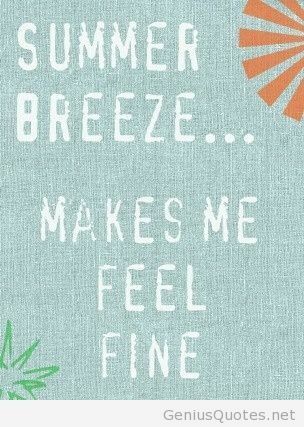 The weather men continue to warn there’s hotter days ahead and the days are hot as well for those head out of home or air- con office but the homebound I still enjoy the summer breeze. 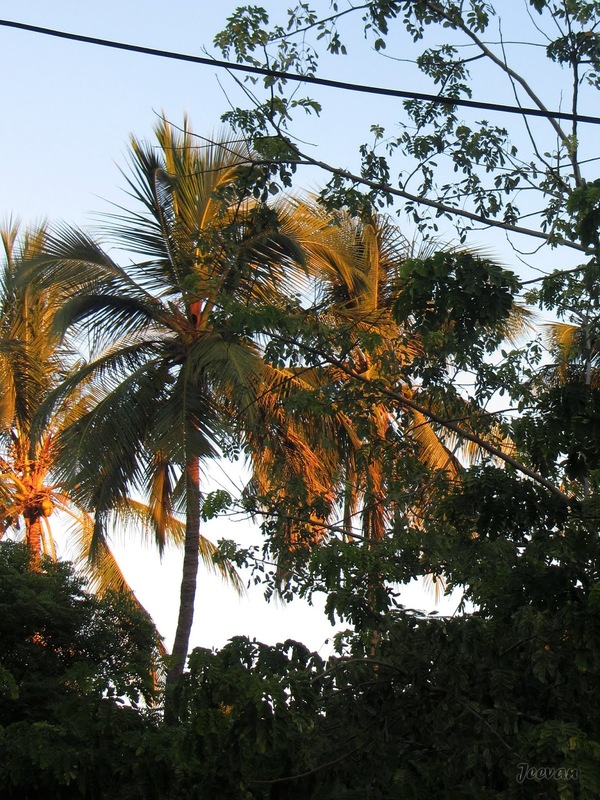 One evening early in March my sky looked this way – like a trace of clouds undusted of the sky – right in front of balcony. A recent one from a quiet evening and I really liked this moment and simple sky that has anything significant or magnificent to excite but there’s’ a sense of peace amid the unsettled birds and vehicles. 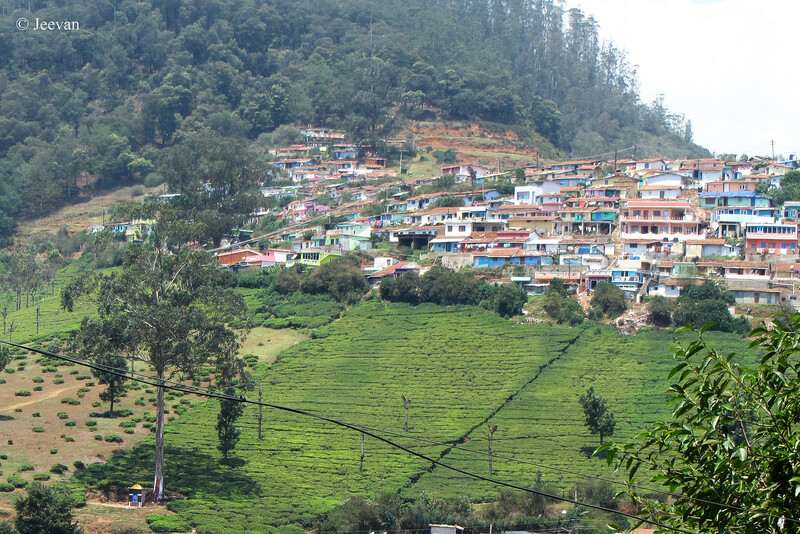 Elk hill is a hillock facing the Ooty town and the other side sliding down the Ketty valley, on Nilgiris, has slopes of hill residents and private resorts with tea gardens and woods spread around. 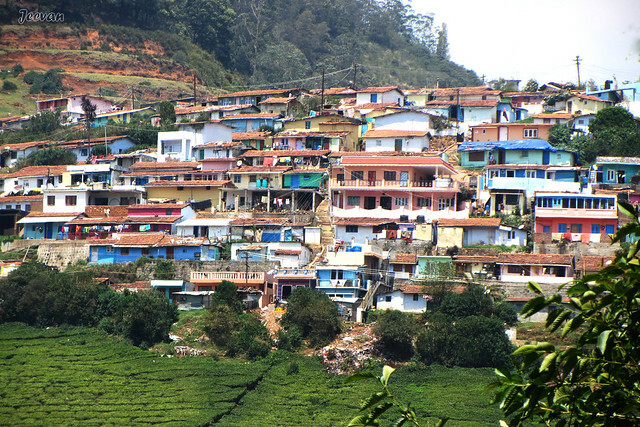 Glad I was able to homestay right opposite to the hill (during my visit to Nilgiris aka Ooty in April 2017) to have a wonderful look on the same and the houses built in step formats. 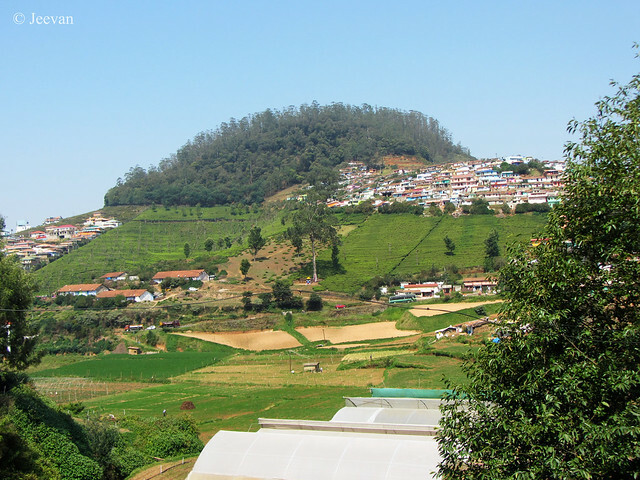 Our homestay had two big balconies overlooking the hill across the carrot and vegetable farming and Ooty-Coonoor main road. I really enjoyed this view and also the night ones with glittering lights from the hill residents (unfortunately I don’t have photos from night) and most of the houses built on the slope was tiled roof and built wall-to-wall with neighbours. I hope they all live as a community with peace and harmony unlike the different colors of house which perhaps one of the reasons for me to zoom for details. Looks most of the houses built there has to take only steps since there isn’t space to lay roads. Btw. I don’t have any idea or found details why it is called Elk hill, but it only wants me to think either it should have Elk deer once on this hill or British (who discovered Ooty) brought some from their homeland. The other side of the Elk Hill has a popular Murugan temple built on the idea of Malaysia’s Batu Cave with a moderate golden statue of Muruga. as life restarts, to survive. as sun warm-up to glow. from the day or night sleep. flashed in its grey shades. P.s. 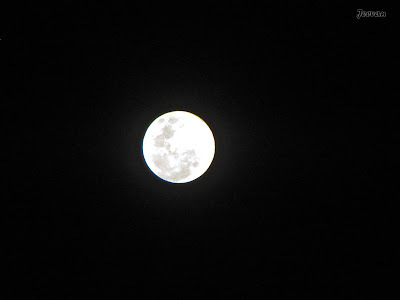 The image has the Supermoon from Feb 19 and it was captured by my mom as i couldn't look at the moon from the balcony since the change of the angle of the moon. One of the three street dogs my brother taking care of fell into an apartment well in the backstreet this evening when two of the three went playing around. There was totally fived dogs gave birth by another street dog and my brother fed them all, where among two was killed in a street accident (a year back) and one was adopted by my cousin sister and other two by my brother. 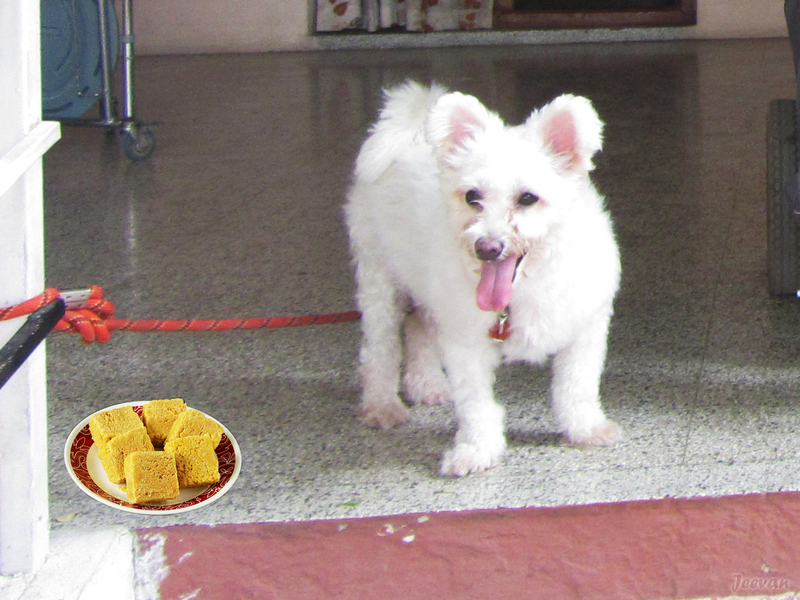 Now, as we moved close by a door next the three dogs continue to enjoy their company and were all fed almost together. Though it annoys sometime and has created lot troubles early, they all settled well around now and get used to the balconies and terrace above our home. 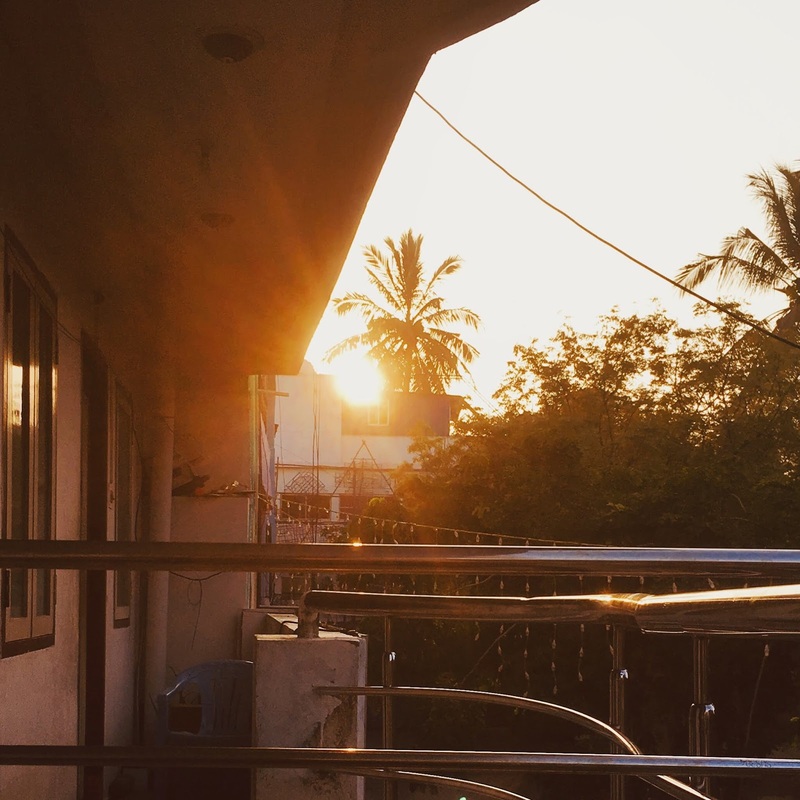 Ours is a three storey residential building and we reside at the first floor and adjacent to us was my cousins so we let them take space at their own comfort except coming into the home. In day time they roam on streets and come home only for night sleeps and naps. Coming to post, the dog Jack (in photo above) fell into the well when it went on top of a net covered well, at an old apartment complex in the backstreet. The apartment walls are very low and anyone can leap into the apartment and the two dogs (Jack and Black) went playing around there and the rusted well net couldn’t hold the Jack’s weight and it fell into the well. Glad there was two to three feet of water in the well and the Jack safely landed on the water and hold to the wall with its back legs pedalling and the Black continued to stay back barking at the well, signalled the people about the fall. Three little kids ran to our house informing us and my bro has been out then, so on information he rushed to the spot and my cousin and his friends brought a rope ladder on rent and Jack was rescued safely by my brother who climbed down a nearly 20 feet well. Jack has climbed on his shoulder as soon he gets down, perhaps he must have scared enough. Jack is a hefty dog and climbing the rope ladder along with him isn’t an easy task but my brother’s attachment with them made possible. At this place I remember the nursery rhyme – Jack and Jill… to fetch a pail of water… from the well up the hill and Jack fell down… here the Jack fell inside the well rather down the hill! Jack is a calm dog and much responsible among the other dogs and never been rude or threatening but his bodily and furry look may create panic to by passers. Jack brought its features from her mother whom I guess was a cross of Himalayan Sheep Dog because Jack resembles the look of the breed. Glad he was rescued and I hope he won’t go there again. 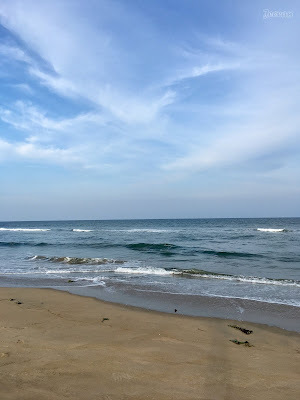 Early this month I took a ride on ECR (east coast road) just to pass some time and travel but later nearing Mamallapuram, my parents instantly planned to visit one of my uncles who wasn’t well there. To those unknown, Mamallapuram is my grandfather’s hometown and many our relatives lives there and it is a 7th century sculptural town renowned for its stone carvings from many single rocks or monolithic. But I’m not here now to describe the town or its popularity or UNESCO status instead want to share some pictures of a small park at the entrance of the town belong to A2B, a popular restaurant chain. 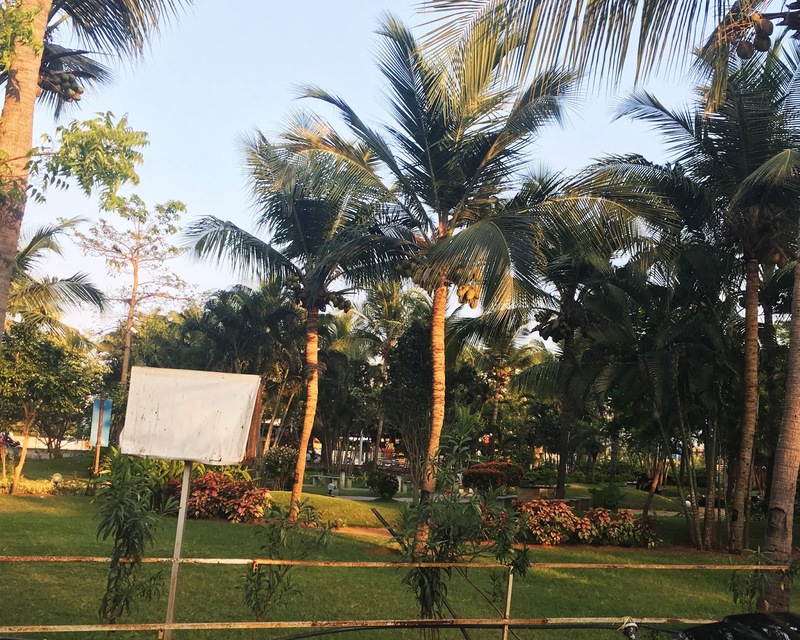 We stopped at A2B to buy some sweets and snacks as we visit our uncle there, I liked their simple park with walk paths, green lawns and many palms to make it look so green and beautiful with bordering flowering shrubs. Dropping parents at uncle’s house we moved into the town for some glimpses and caught at traffic, since it was Sunday the places were all thronged by tourist. We quickly exit at the other end and turned back to uncle’s house. A house sparrow discussing with its reflection about the loss of their habitation and livelihood thinking it was another bird! 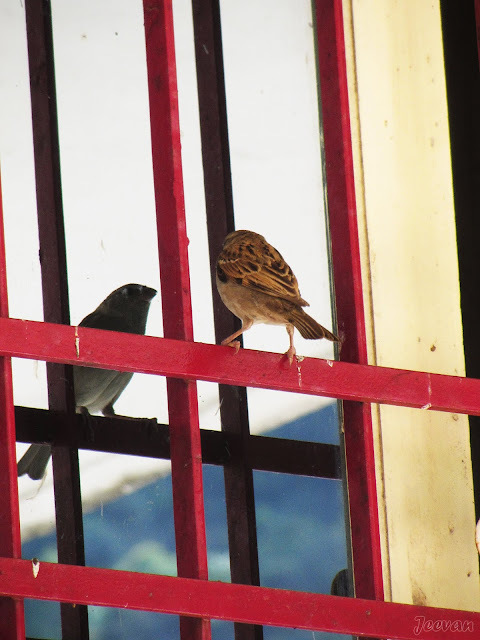 But the sparrow was actually knocking at the glass window constantly in a manner of fighting out the other. It sensed me that they are actually knocking at our doors to let them have their space but us insensitively denying their rights and given importance to our hum him. We can’t blame anybody to enjoy their comforts and benefits available at the globalization, but did we really gave importance to something travelled along with us or realized what we missed in excite, the thing that was overridden or overtaken to let it fade through the rear mirrors. March 20 was World Sparrow Day! And House Sparrow is a species designed to mingle and sustain with people but the reality was we failed to live up to their simple needs rather concerned only our comfort, style and hi-speed telecoms. 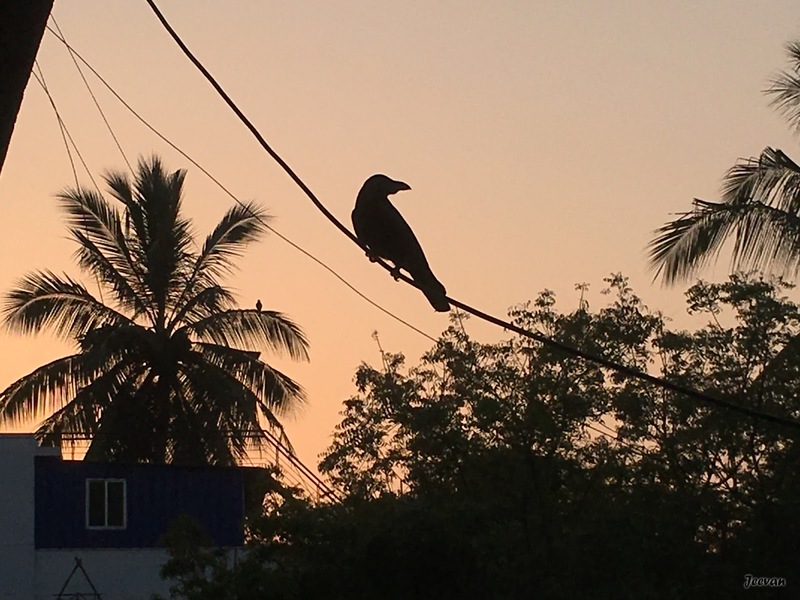 The Western Ghats, along the south west coast, plays a pivotal role in preserving the tiny house sparrows whose company we enjoyed until 2k, where the transformation begin to descend the harmony of their voices from our lives esp. in cities. I always enjoy their presence whenever I visit Western Ghats as part of travel and the picture was shot on same. 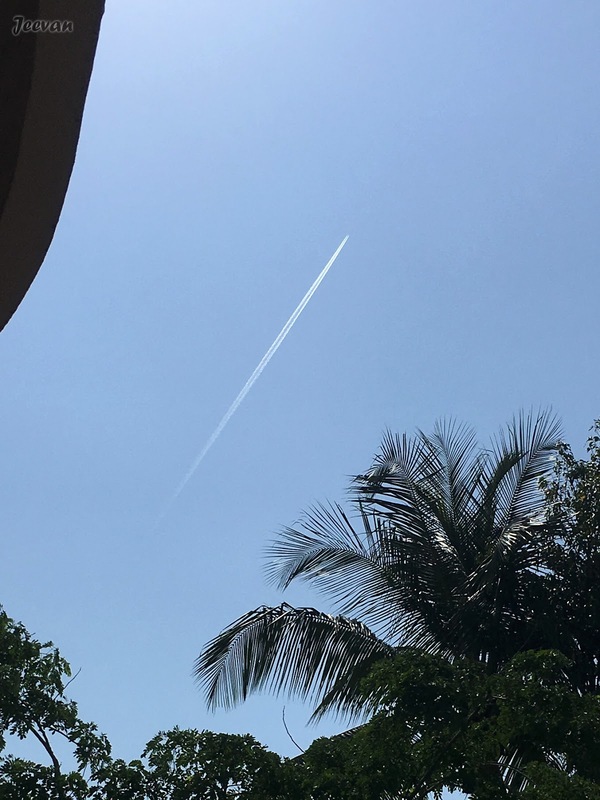 Other day I was watching at the sky, in a regular manner after moved to our house with balcony, I find a jet plane speeding across the sky up high and took these snaps instantly before it move out of my sky or contrail disappear like in the picture below. 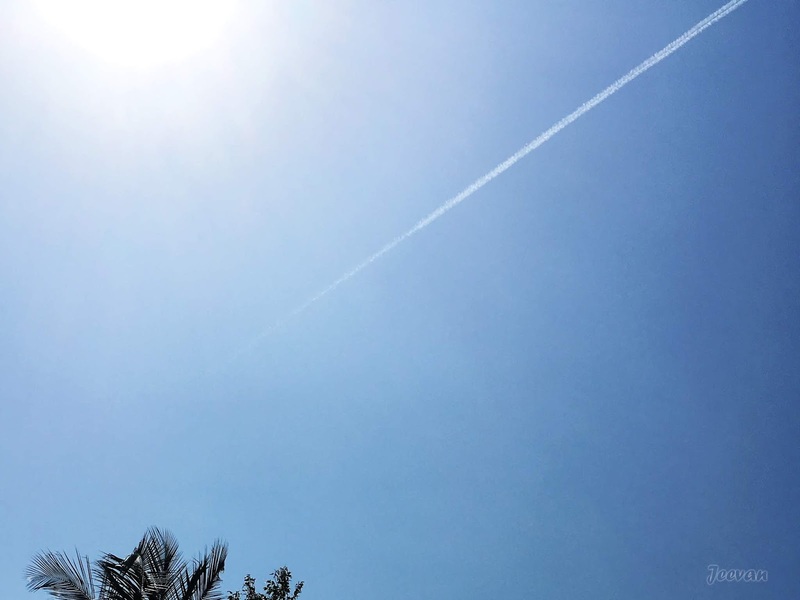 I really want to zoom on the jet but the iPhone doesn’t allow me to get clear near image, maybe someday I could with camera. Few days before to the consecration of a Ganesh Temple in the backstreet, they started to decorate the streets with colourful lights and lighting cut-outs of Ganesh and Murugan idols at the street corners and junctions as a led to the temple. 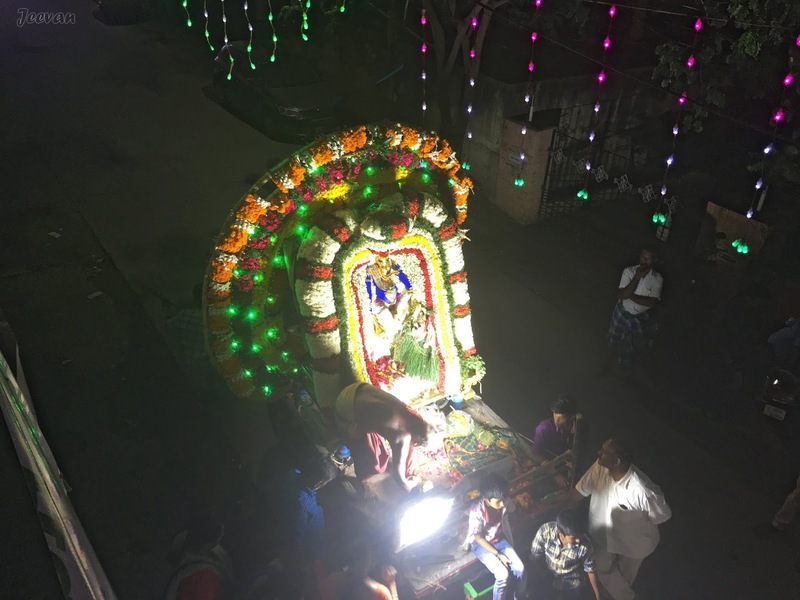 It’s a small temple in size of 8x12 sq.ft and consecration is a custom take place at every temple once in 12 years and this’s the first time (I think so) after the temple was rebuilt with new Ganesh idol. The original idol/statue of the temple was brought by my grandfather and his friends after finding it from a village pond but that Ganesh idol was little damaged at the limb and was the talk of changing the idol as people believed that a damaged idol shouldn’t be worshipped. 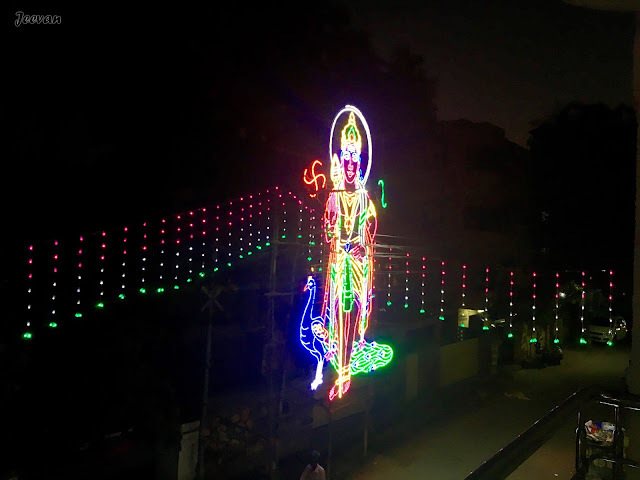 Since we moved out of the area in Dec 2005, I don’t remember when the idol was changed and I hadn’t got to take the backstreet often until we moved back to same in 2015. The backstreet and the Ganesh temple hold many memories related to my childhood and friends and whose play area were mostly around the temple and mud streets. Since my two best friends came from backstreet, we hit often the streets after back from school and on holidays and I have walked countless miles over there despite my difficulty in walk. There are some guys (from backstreet) take response to conduct festivals and Ganesh Chaturthi themselves by collecting money from the residence – whose amount mostly go to their pockets – to conduct special pujas and cart procession at night. Last year the Ganesh Chaturthi wasn’t celebrated due to the consecration ceremony, the collection of money this time was heavier or 2-3 fold higher than the Ganesh Chaturthi collections. 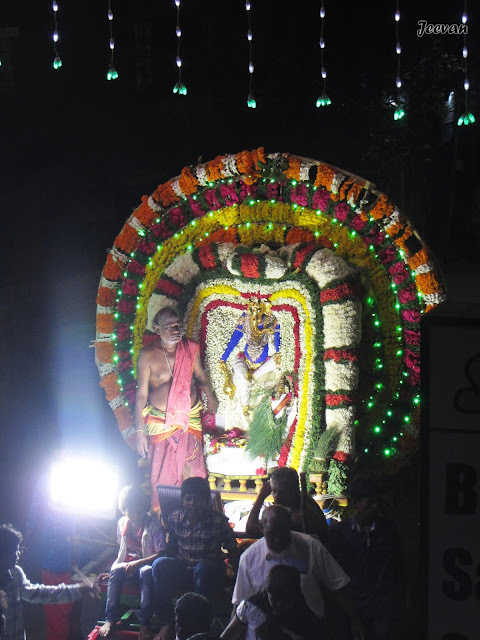 Coming to the post, the consecration took place on Sunday morning and there were enough crowds and the area was in festival mood with traditional instruments (my favourite Nadeswaram and Thavil, like in picture above) playing loud through the loudspeakers along the chanting of mantras by priests. They played devotional songs now and then but glad they weren’t disturbing kind and only lights were decorated our street to look colourful for few days. 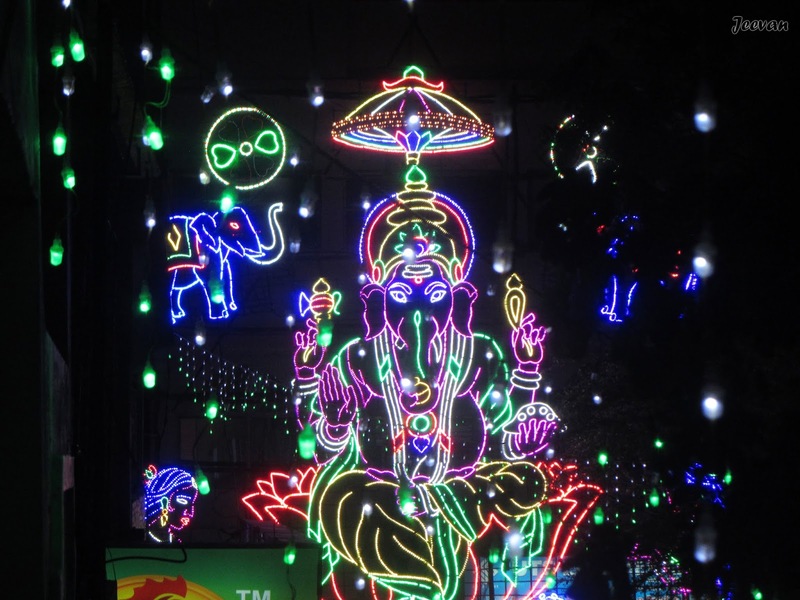 From the photos you could see the glittering lights and cut-outs placed on our street – right opp. to our house was Murugar decor and at the left corner was Ganesh on seated position – and couple of shots on the night cart procession. 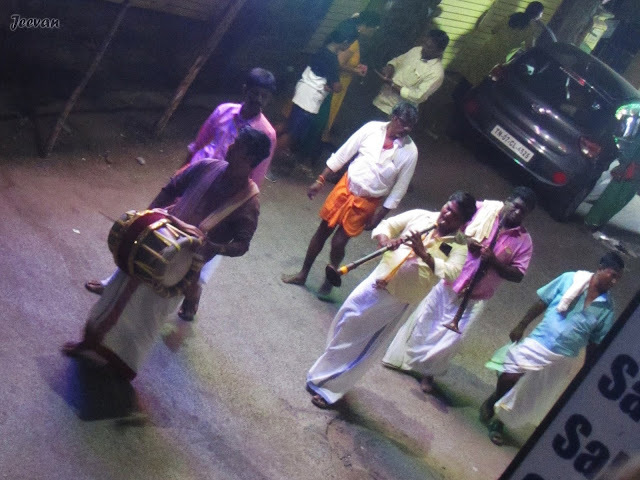 Usually they make loud crackers and I find it terrible to take photos on the procession when one blast close to us, but this time they did blast fewer crackers (perhaps because of Supreme Court order) and the cart procession went off peaceful with light instruments play. 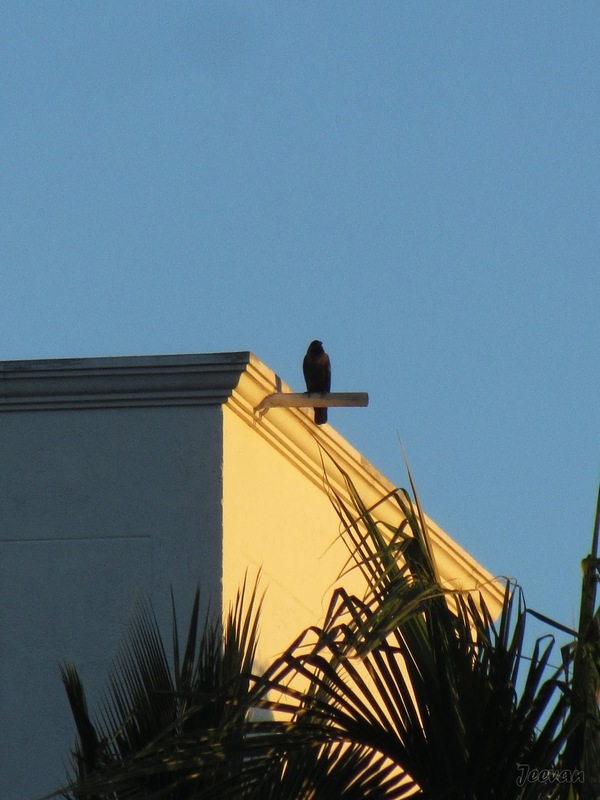 All the photos were shot from my balcony. Other day I waked up early and got to watch the activities on our street, what I regularly miss since I wake up not less than 8 am. 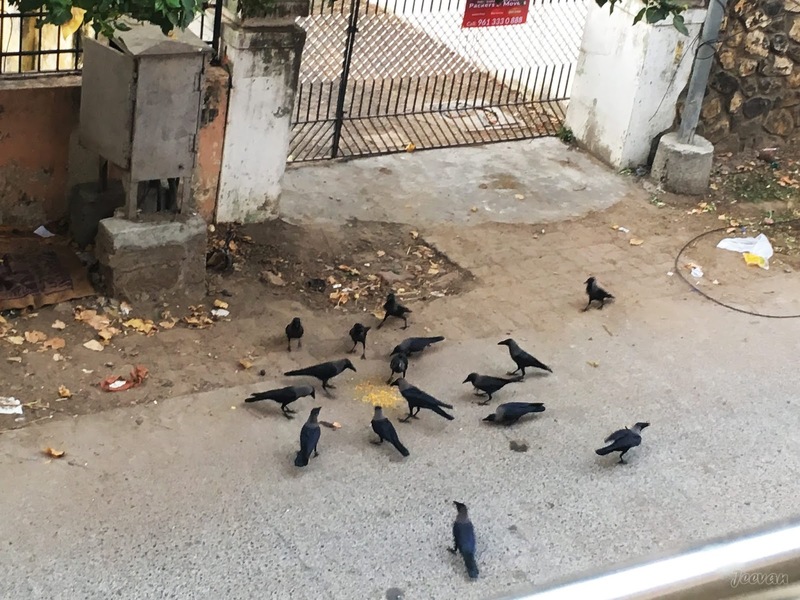 And just before the sun rises above the building on east, the neighbourhood crows had their early breakfast – some kind of snacks left on road – and what I really liked was the way they all gathered (neatly) like people sat around a round dining table. Following the disperse of crows, comes out a glowing sun spreading its warm light glittering through the stainless steel rail of the balcony, and without putting flame glows the coconut palm through the climbing up of sun. to enjoy a vacation that I made not in a year. I usually hangout with my lap and books. while I continue to windlass from wheels. 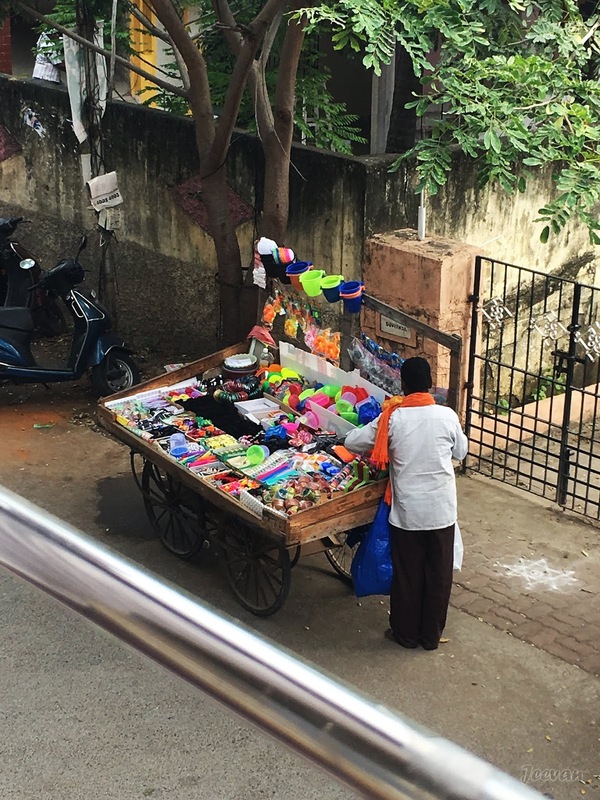 A street vendor, in push cart selling colourful items of house and beauty accessories - a shot from my balcony. During the wait at the toll gate on ECR (east coast road) in Chennai, I used to take photos sometime on the plants and rock paintings decorating the medians that separate the lanes for vehicles to pass through the collection booths. 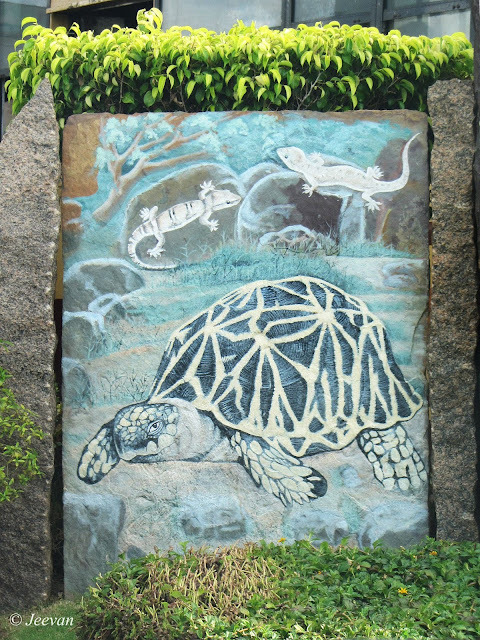 I here share couple of photos shot at the beautiful rock paintings on critters – different kind of butterflies and a turtle/tortoise and lizards – from two different stops at the toll gate. 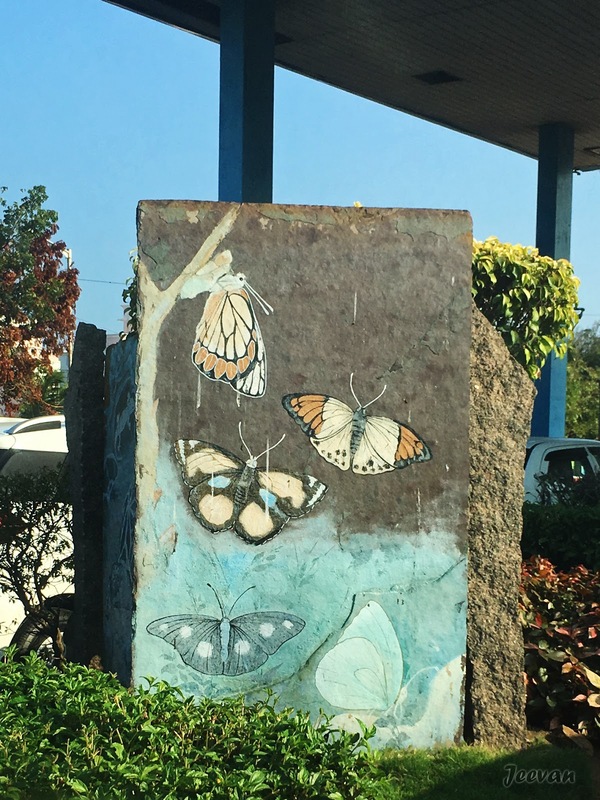 These paintings are there for more than a decade (without fading) and sometime I try to capture them depending on the vehicles movements and pace and my interest. The butterflies above were shot with iPhone and the tortoise below was a camera shot. 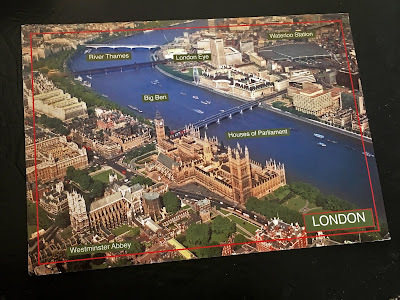 Receiving greeting card or postcards is a favourite thing from the past and those days we used to exchange greeting cards with cousins, during the festivals and New Year, and I used to collect those as a treasure and keep safe, just like the cousins do at the other end. But I lost many of them in the transfer to different houses and I only hold what I received in last 15 years, where I have sent more than received. After I learned Photoshop I started to create my own postcards using the photos I have taken and put words from my thoughts. 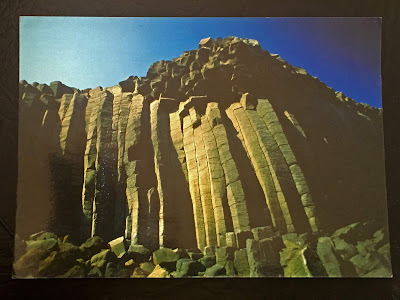 Creating those postcards gives me a content feeling then, as I go through my personal thoughts and ideas rather picking up a greeting card from the stores. 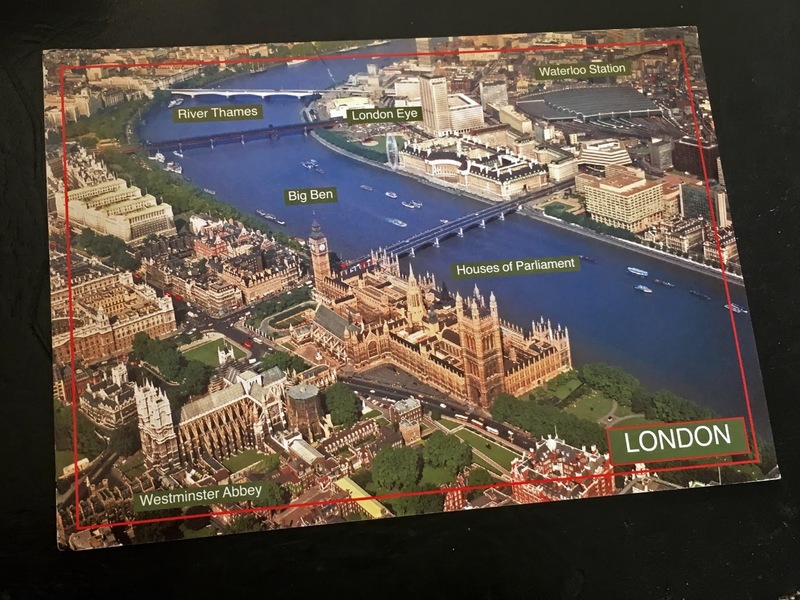 But after the run-up in advanced communication through mobiles and internet, people started to show lack of interest and enthusiasm in sending and receiving cards and thus the exchange drops put down the practice. One of our grandfathers (Dad’s uncle) passed away yesterday and I really wish I write about this gent who I expected to stay longer, despite his age – he turns 80 this year – he was healthy and fit as well with a clear and conscious mind-set is bit harder to find out these days. He was someone straightforward throughout his life and talks what’s in his mind whether the people listen likes or not and because of this some could feel disturbed or annoyed but he was mostly right on things and say what’s good for others which sometime would be hinting their mistakes and stroke pride to make feel bitter experience. Thinking back I too have felt disregarded sometime listening through his speech but when I could understand things the truth in his words made senses despite his difference in attitude. He had a diploma in civil engineering and had worked and retried from Tamil Nadu Housing Board dept. and only with his earnings he built a house and grown his 4 children (where 3 were graduates) and married them all and 3 were married within relations. After he was married with dad’s cousin sister he was fond of my dad and dad used to visit his home to do maths in his school days and all our constructions were executed under his instructions and planning and he’s someone never compromise on the quality and strength of a building. He had a special care for me and used to enquire about me wherever he meets mom (who was named by him, as Lilly) or dad and one time he took me to one of his neighbours (practicing touch healing) whom he believed could do something on my disability, after seeing someone being healed. But it was quite nonsense method and I don’t want to narrate the stupidity, and what I really saw there was a grandfather’s love and his intention to get me cured in any means. He was a healthy person all his life and a never changed personality, adjustable to the situation and practice friendliness with everybody. 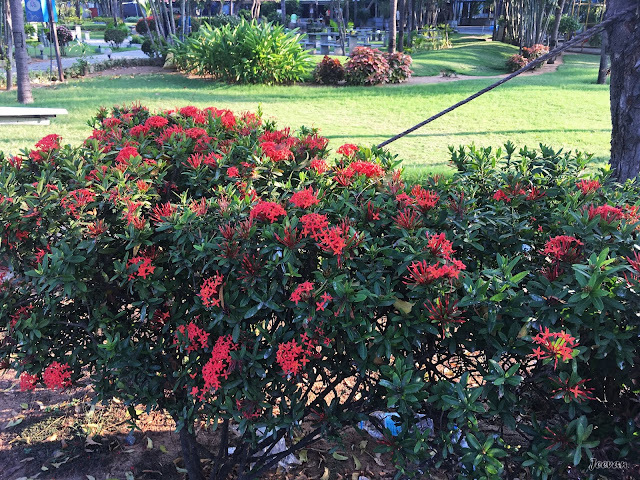 He shares the age of my maternal grandfather, who passed in 2015. His fitness and active lifestyle is something would inspire anybody despite the ages, and even after a cardiac attack, less than a decade back, he become more conscious on his health and food habit to sustain deed. We never expected him to die very soon, despite being very stable for his age, and active till he experience urinary infection and backbone squeeze few months back. He was on medicine and cast to produce much trouble and pain but on one expected the problem he experienced was a sign of cancer at 4th stage. Last time when I saw him (in September) he motivated me to do whatever I could rather stay idle. His last words still resound in my ears. Hope he rest at peace and sail through our memories. A Gopro shot on one of my favourite routes – Dindugal to Kumli – and this is a part of the scenic road around Periyakulam which shot during my last year travel through Theni district. 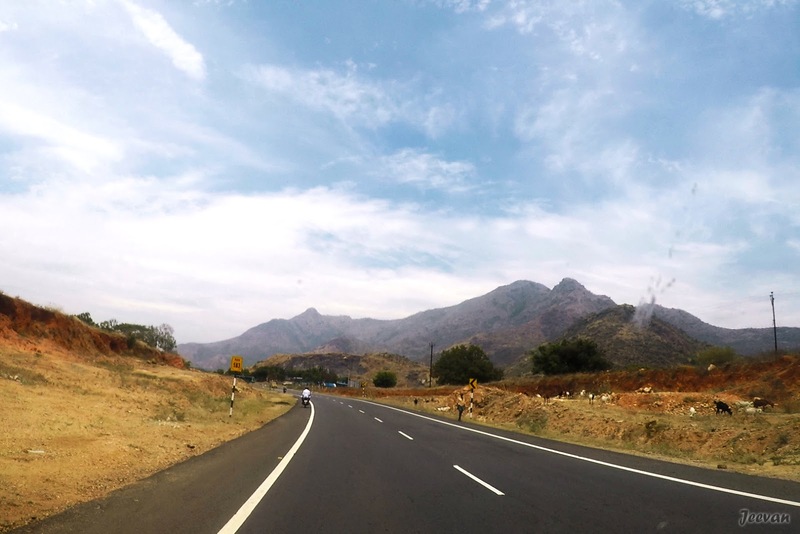 I could not keep away the camera whenever I travel on this road; the Western Ghats Mountains is a great companion stretches all along the route and sometimes the mist covering mountain tops are blissful to watch and even on sunny days it would be a pleasant ride breathing the mountain breeze. 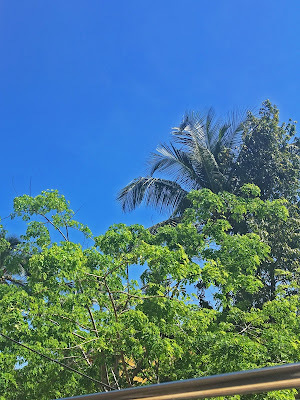 And the sky as well is a pleasure to watch with different patterns creating a wondrous upon the blue sky and being a fertile soil throughout the district esp. 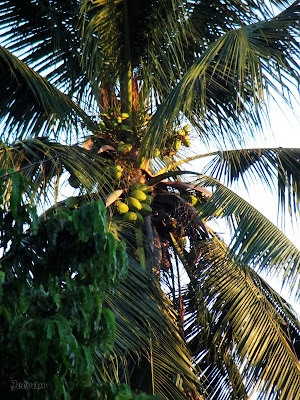 the Cumbum valley is enriched with flouring farming and being a treasure trove of Tamil Nadu, where one would cherish when travelled through. 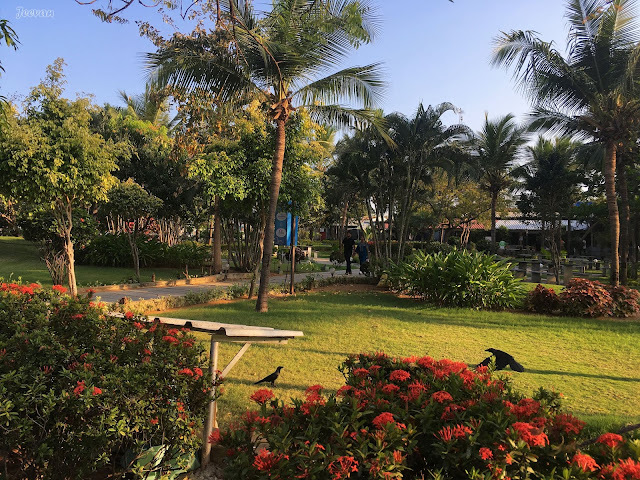 Here’s part 3 on the series on Check Post where I would like to share moments related to check posts that I have come across during my travel. Today’s post is on Berijam. 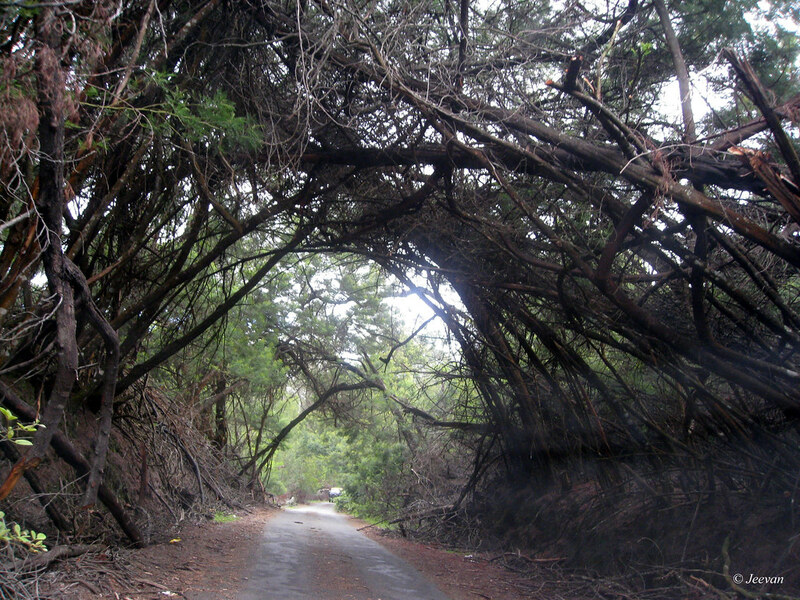 It was in 2006, we ventured into the Berijam forest near Kodaikanal and it was my cousins’ inspired me not to miss this place when I visited Kodaikanal for 2nd time and it was many time already for them. I hear them saying that leopards/tigers visit Berijam Lake to quench thirst and bison are common sighting the way want me to visit and experience adventure. 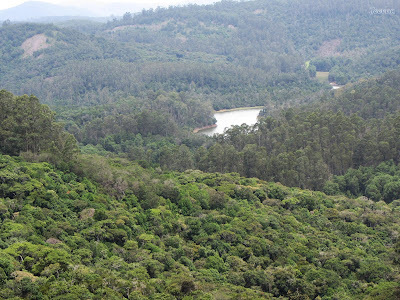 Berijam is a pristine lake area located inside the dense forest and visiting it needs prior permission from district forest office (DFO) at Kodaikanal. A warden who arranged accommodation for us at Kodai, at that time, did help obtain permission to visit Berijam where only 20 vehicles is allowed per day to preserve the natural environment and wild. 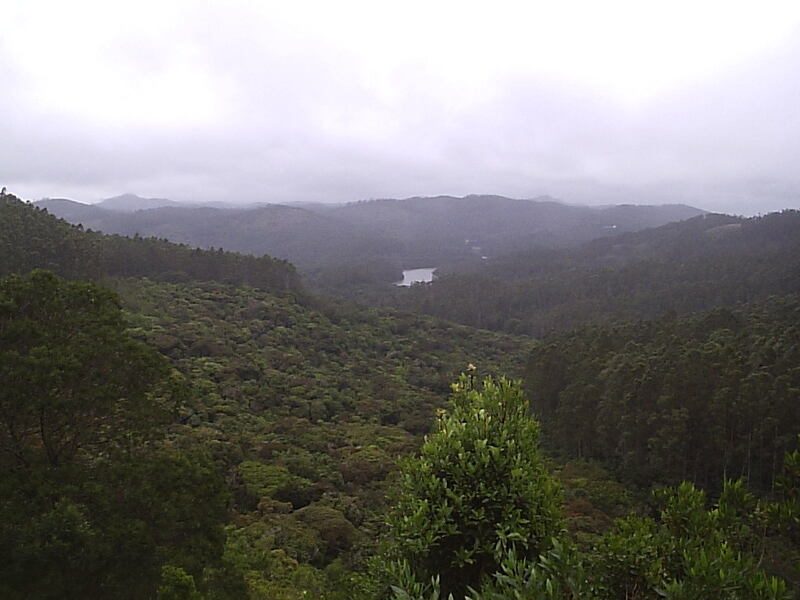 We reached Kodai a day early to my aunt’s family join us on the trip in their car and we in cab SUV, but we got permit only for our cab car and we already 9 members on-board, received my aunt and two little cousins for a drive of about 30 km from Kodai. We doubt really will they allow our overloaded vehicle at the check post, but glad they didn’t check our vehicle and only dad get down to sign at the check post and we drove through one of the best preserved wild environment of flora and fauna. The entire area is a biodiversity and unpolluted earth and it’s a complete pleasure and refresher to venture and its advised not to get down anywhere other than the specified spots. 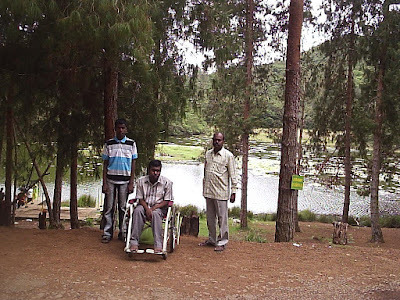 There’s another check post at the Lake area, where vehicles are stopped and parked aside the road and to check the place only by walk, but they allowed our car to drop me close to lake to get down to the wheelchair. I used manual wheelchair then and we spent some time on the lake bank, and taking photos it slowly started to drizzle and furthered showered rushed people to their cars, since there isn’t a place for shelter there. My wheelchair was pushed speedily by my brother to prevent getting soaked and in the force a front caster of the wheelchair came out and I was pushed further in tilt position till the car. Berijam is a freshwater swamp lake and people are allowed only at defined space and to and fro through the car, our eyes were spotting for any wild animals. I have visited Berijam couple of times after that and there isn’t much changes on the place for good and each visit was a different experience for me and lately the forest department itself running an ecotourism trip to Berijam and the number of private vehicles allowed has also been increased is certainly a disturbance to the ecosystem there. Berijam Lake is 9 km in circumference and located at 2165 MSL and it is also considered as one of biggest freshwater lakes in Asia. 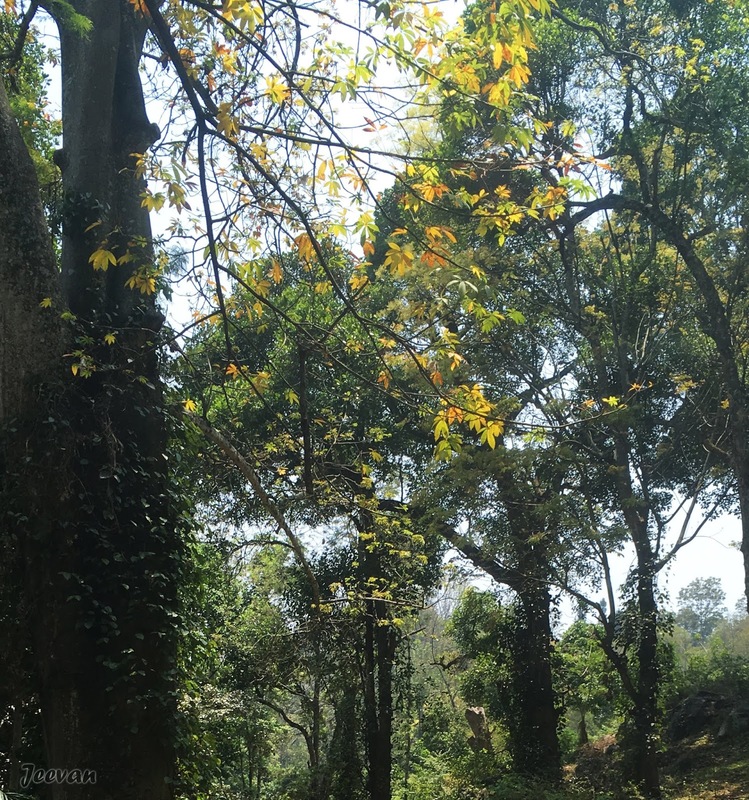 During my second visit I encountered Sambar deer, Langur and Giant Malabar Squirrel but beyond that the presence of nature and calmness wants me to go their how many times possible. floats aloof in wind direction. that never seem to end. Winter has its way out, like every season, slow extension of daylight sense the injection of sun and warning summer and at the end of the day it glows. 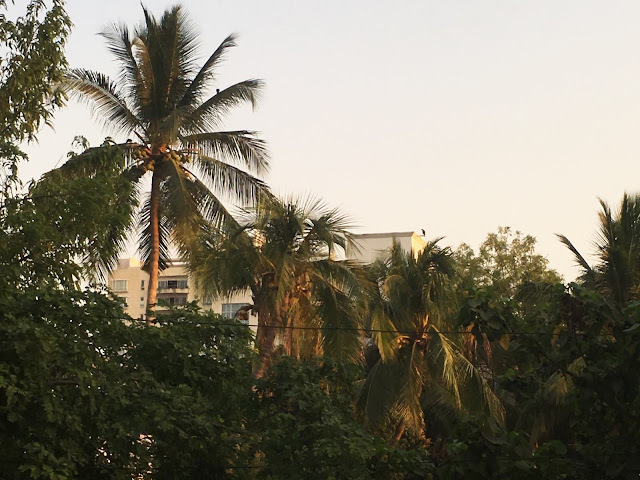 Even after the sun disappeared behind the buildings, the trees top are set to glow by the fierce rays of sun, sneak peek through the gaps of buildings. 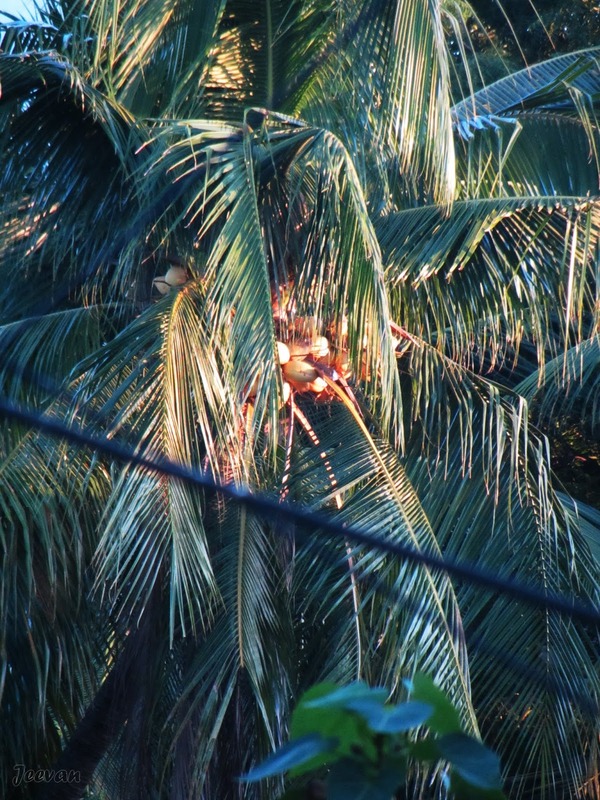 The light exposed on the greenish orange coconut palms enhance the glowing light to golden treat and it was quite a simple pleasure I got to watch few time. Although these are some capture from last year or before winter, the image weren’t different now rather going strong with glow where I could get even leafy shadows on trunks. 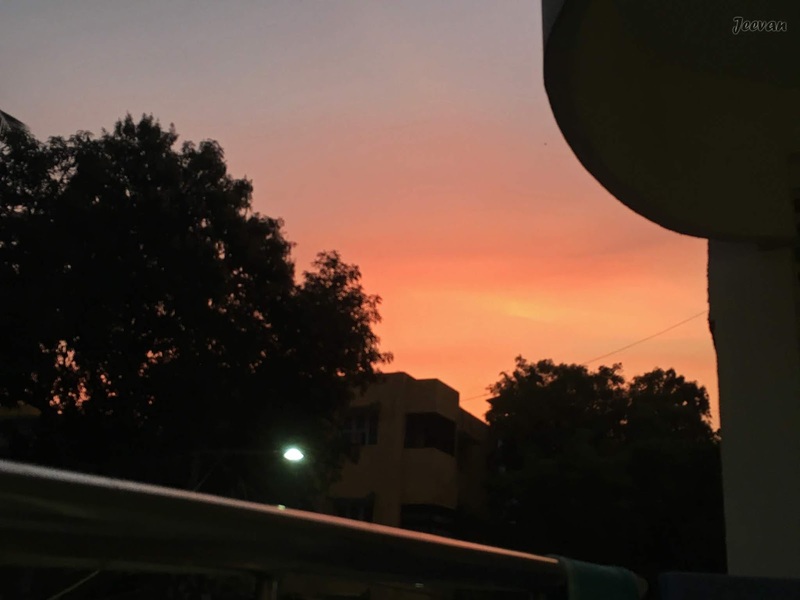 I wasn’t out anywhere lately and sky watching has become an activity and I take many photos mostly on sky these days. I saw a lone pelican last evening crossing my sky and sometime a bunch of white heron – which used to be common sights in past – but everyday about 6 pm, number of bats pass our sky, a regular journey of them from the trees of Theosophical Society to other bunches of trees along Buckingham Canal in Adyar. 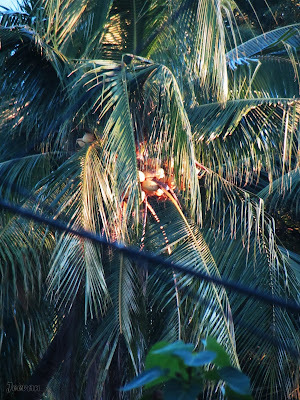 And they turn back to the Society in early morning which I ever woken up to see in the last 5 months, since shifted here. But my uncle confirms that. 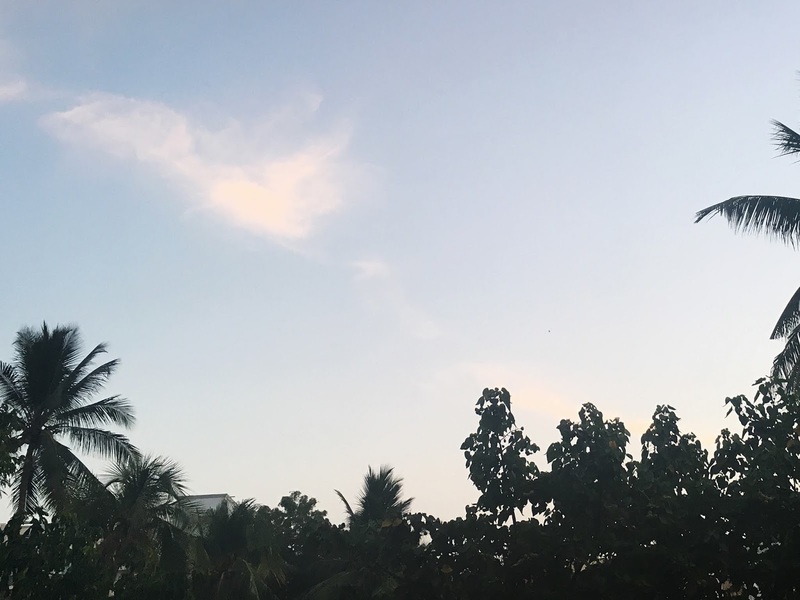 Glad I have this open sky in front of the house, surrounded by trees and a balcony to skywatch, keeps me going despite the haunting thought of traveling, which I haven’t done one close to a year now. 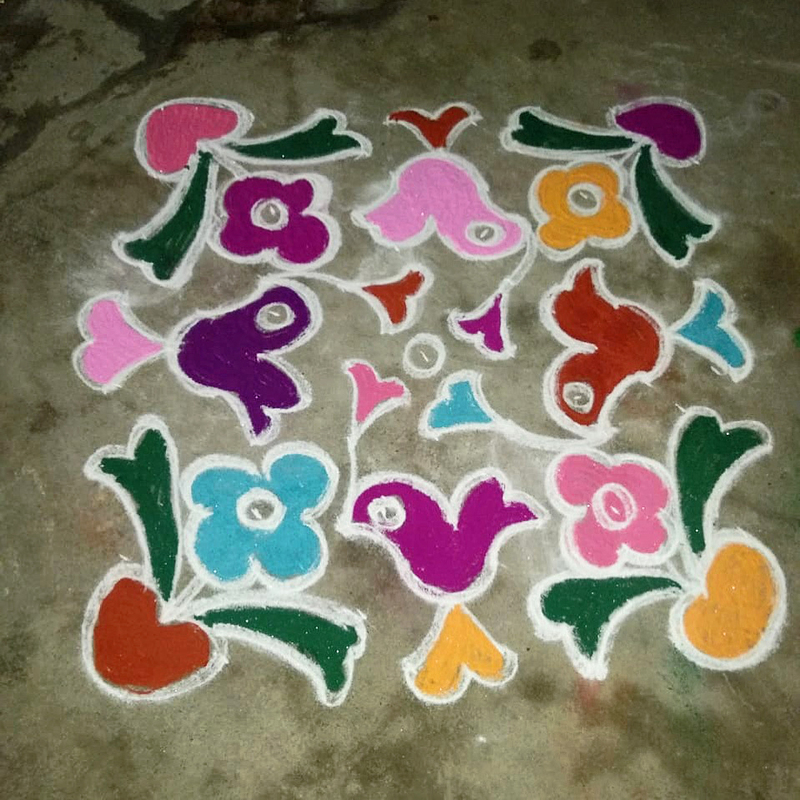 My aunt's colorful Pongal Kolam drawn last month during the festival of Pongal, very next to mom's Pongal pot kolam. Kolam is a custom followed by the households in south India and it’s a daily activity for many, including ours. 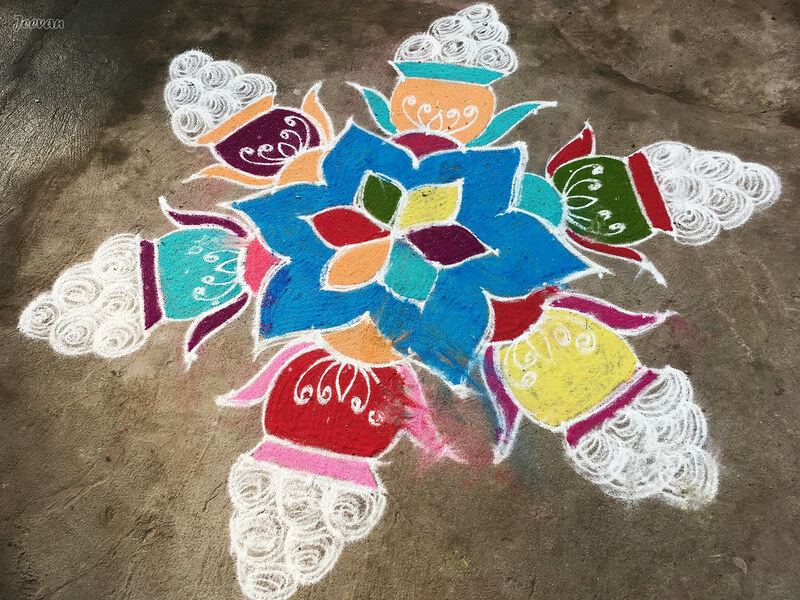 And Pongal Kolam is popular during this time and many put great efforts to make it look wonderful and colourful including drawing something relevant to the festival. Kolam always been my favourite thing and I enjoy watching different patterns and for me, Kolam is apart any belief and its way of exhibiting art and beauty. to compose into a song. birds sing from bare trees. 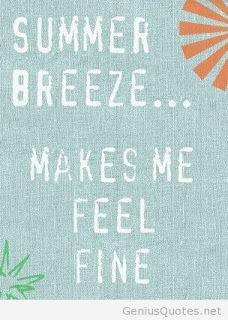 we’ll only do feel that. Check post is a series I have started (click here for post 1) where I would like to share moments related to check posts that I have come across during my travel. There’s a check post everywhere and these check post are important in sustaining a control over unruly esp. when it comes nature environment, wild and national defence and interest. Let it be anything, crossing a check post need consideration because skipping any working check post will land in trouble. Though we hadn’t messed up anywhere but got warned by the check post guards sometime and threat a penalty. Just like in the previous post, where we stopped by a forest dept. check post before entering Hogenakkal and this post too is similar to the evening but here it was afternoon when we try to cross Papanasam check post to visit Karaiyar Dam in Pothigai Hills. 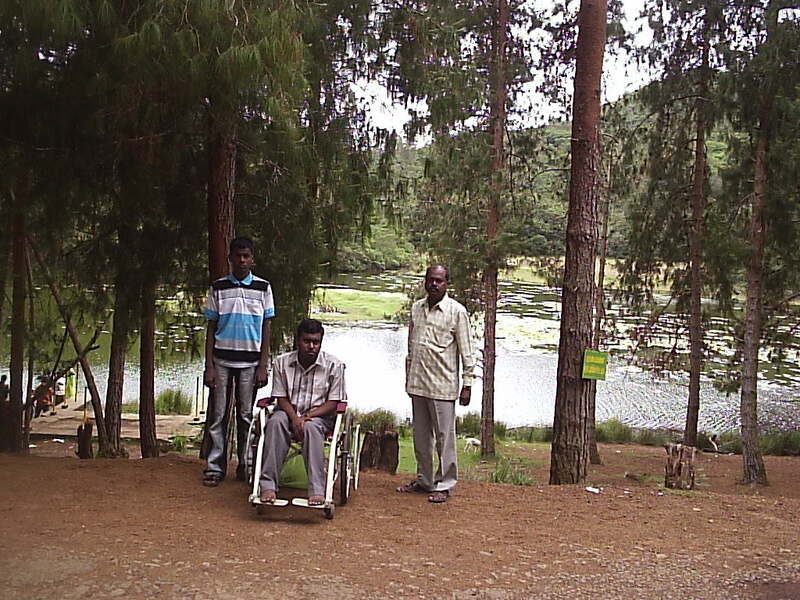 It was in 1999, during my first time trip to Kodaikanal and Tirunelveli; we visited Courtallam on the 4th day of our travel and then went to Agathiyar Falls inPapanasam and Karaiyar Dam (which weren’t in our plan) and we had no idea about this terrain as well. It was our friend who hailed from Tirunelveli, took us around the places and guided us on the entire trip (which I think I need to write a separate post on it later) and after taking showering from the popular Coutrallam waterfalls there we pursuit to Karaiyar Dam, which is 10km uphill from Papanasam. The forest check post at Papanasam blocked our Ambassador car, and I guess they request for a permission letter and if I remember we paid some amount per head of us for them to allow inside the Mundanthurai Tiger Reserve, where the Karaiyar Dam is built across Thamirabarani River. The road was narrow and potholed at many places where our Ambassador car passed effortlessly and entirely the road was silent and far empty with couple of stops with EB quarters and some settlement. The road travels along the Thamirabarani River and we could see huge pipes taking water down to the PowerStation at the foothill. I felt a sense of quietness all over; except for the voices inside the car and it was there I spot the Nilgirilangur for first time. The water level at the dam was far down then and a row of boats were parked along the bank to take visitor (on their willingness) to the other side of the dam to check Roja Falls – named after the popular film Roja where it was shot. The view that I got from the dam is etched still on my mind. I rarely had a photo on it where I really need to dig out from the old photos collection. 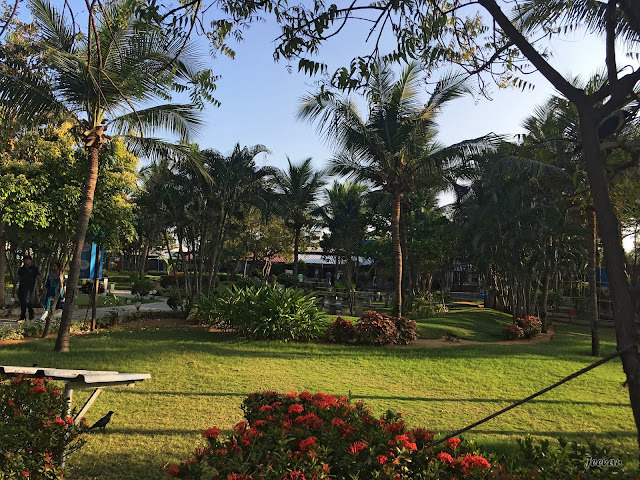 I was so interested taking the boat ride there, despite the ankle sprain I got on Kodaikanal; we were in lack of time as we need to head east to visit Tiruchendor before the end of the day. 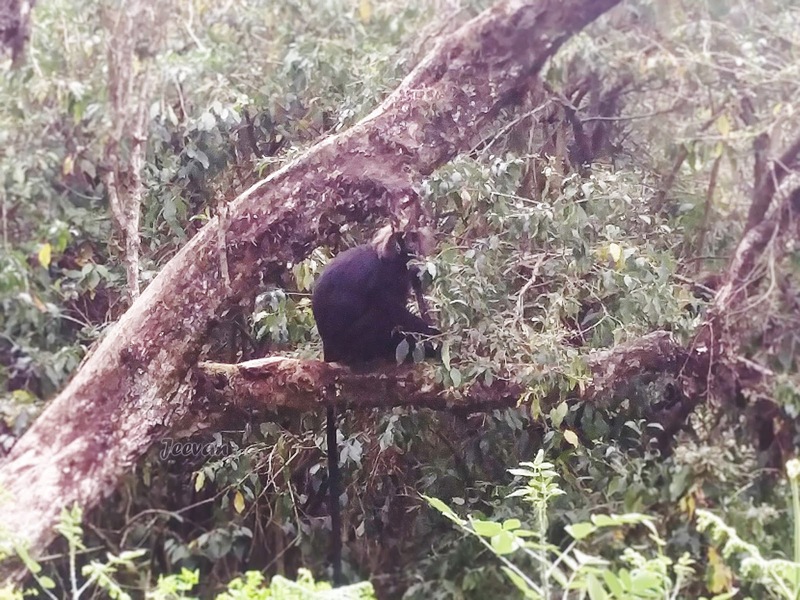 The picture of Nilgiri langur (above) was shot from the wilderness of Nilgiris during my visit in 2017.
like a string in music. 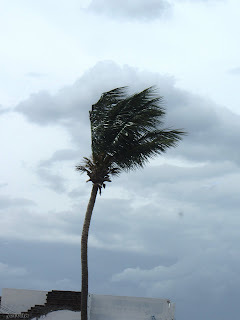 the wind blows to ground. Kolam is a custom followed by the households in south India and it’s a daily activity for many, including ours. Kolam always been my favourite thing and I enjoy watching different patterns and for me, Kolam is apart any belief and its way of exhibiting art and beauty. Our dog Maya loves anything that taste sweet (which I’m not sure all dogs come under this category) and whenever we have something she used to bark which means she needs some bit too. We rarely offer her some piece of sweet or cakes or cookies made of chocolate to satisfy her unending desire and to make her have medicine or tablet we used to hide it inside the sweet or chocolate because she never took easily orally a medicine. Sometime we voluntarily drop a tablet in front of her and pretend to pick it up where she swiftly act and take the tablet in mouth. Rarely she eats the sweet alone and split the tablets separately. We don’t keep down things Maya is interested on when she was on loose and sometime she behaves senseless picking anything from the house dustbin. Two days back, relatives visited us and they brought a sweet box and some fruits which mom had left on the floor in thought Maya were tied and forget to shift things from there. When we saw later everything was fished off the sweet box. Maya had eat 1/4kg of the Mysore Pak and looked with a weighted tummy as if having offsprings and also found difficult to walk. We really thought/worried what going to happen to her as she already have wheezing and weaker heart and this heavy loaded Mysore Pak (made of generous amounts of ghee and sugar) could cause anything. But glad she’s doing well and turned normal next day after couple of toilet visits. About Mysore Pak: It was originally called as Mysuru Paaka, in which Mysuru indicates the city of Mysore, in the Indian state of Karnataka and Paaka means sweet syrup, is a popular Indian sweet made of ghee, sugar, gram flour and cardamom. before the night cold elevates. in the darkness of light. Check post is a series I have started (at a blink of thought while reading Hot Tea) where I would like to share moments related to check posts that I have come across during my travel. I could remember some check posts that went smooth with the guards permitting, giving tips on the route and encouraging kind of guards and some are stubborn to stern to warn us to turn back and it’s not the check posts actually but the location and places we like to venture makes it possible or not. There are check posts on every border of states, districts, and restricted areas like forests and dams and the foothills to prevent illegal activities and preserve nature and environments. Check posts really plays significant roles in controlling smuggling, verifying vehicle documents for right registration and makes sure a secure travel. I remember my first encounter with a check post was in 1997, a barrier belong to Tamil Nadu forest department held us for some time when we try to visit Hogenakkal Falls in Dharmapuri district. 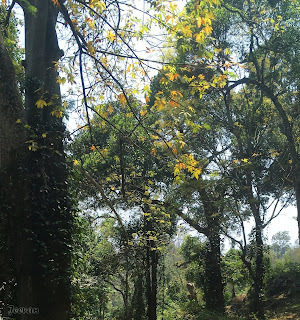 We just drove from Mysore, after our visits to Ooty and Mysore; it was almost night or around 8 when our car (Maruti 800) was stopped by the forest department denying permission to allow us into Hogenakkal which is located inside the forest. Unlike today, it wasn’t a greatly popular tourist place with plenty of lodging and restaurants then, so the movement of vehicles are less and no vehicle is allowed after 6 pm to visit the falls at the bank of Cauvery. It was pitched dark around us except a bulb light from the check post, and a silent noise of forest surrounds us while my dad and uncle was convincing the guards to permit us as we had no other option or idea to return. The guards came down after sometime and we were in chaos sitting inside the car and a mild fear of forest as we couldn’t see even what is near us. We drove past the Ghats section with a small terror after getting permission and we stopped at the Tamilnadu tourism hotel, for a night stay and visited the falls next day morning. Actually there were 8 members in the hatchback and I was 12 then and my brother was 3 years younger to me and my cousin was 2 years. Sometimes I sit in the front seat adjusting with my maternal uncle and other two take the laps of our parents throughout our journey and the trip was entirely memorable and I could recollect the moments still.